For The Outlaws, it was always about the music. For 40 years, the Southern Rock legends celebrated triumphs, endured tragedies and survived legal nightmares to remain one of the most influential and best loved bands of the genre. Now The Outlaws return with a new live album, new focus and an uncompromising new mission. It's about a band of brothers bound together by history, harmony and the road. It's about a group that respects its own legacy while refusing to be defined by its past. But most of all, it's about pride. Formed in Tampa in 1972, The Outlaws, known for their triple guitar rock attack and three part country harmonies, became one of the first acts signed by Clive Davis (at the urging of Ronnie Van Zant) to his then fledgling Arista Records. The bands first three albums The Outlaws, Lady In Waiting and Hurry Sundown featuring such rock radio favorites as There Goes Another Love Song, Green Grass & High Tides, Knoxville Girl and Freeborn Man would become worldwide gold and platinum landmarks of the Southern Rock era. Known as The Florida Guitar Army by their fans, The Outlaws earned a formidable reputation as an incendiary live act touring with friends The Allman Brothers, Lynyrd Skynyrd, The Marshall Tucker Band and The Charlie Daniels Band as well as The Doobie Brothers, The Who, Eagles and The Rolling Stones. Henry Paul left after the group's third album to form The Henry Paul Band for Atlantic Records, and later the multi Platinum country trio Blackhawk. Over the next 20+ years, The Outlaws would experience rampant personnel changes, tonal missteps, ill fated reunions and bitter trademark battles that left fans, not to mention Paul and Yoho, frustrated and saddened. And with the tragic deaths of co founding members Frank O'Keefe and Billy Jones in 1995, and especially vocalist and lead guitarist Hughie Thomasson in 2007, it was feared that The Outlaws trail had come to an end. Along with founding members Paul and Yoho, the band features now several of Southern Rock's most respected veterans. Lead guitarist and longtime Outlaw Chris Anderson is well known for his collaborations with artists that include Dickey Betts, Lucinda Williams, Hank Williams Jr., and Skynyrd. Co lead guitarist Steve Grisham who joined the band in mid 2013 following the medical leave of guitarist Billy Crain is a former member of the Soldiers of Fortune era Outlaws, a noted songwriter whose tracks include The Henry Paul Band's Top 40 hit Keepin Our Love Alive, and a co founder of the Southern Rock all stars, Brothers of the Southland. Keyboardist/vocalist Dave Robbins is a co founding member of Blackhawk and has written hit songs for artists that include Restless Heart, Kenny Rogers and Eric Clapton. Bassist/vocalist Randy Threet has performed with Pam Tillis, Trisha Yearwood and Blackhawk, and is familiar to TV audiences from USA Network's Nashville Star. 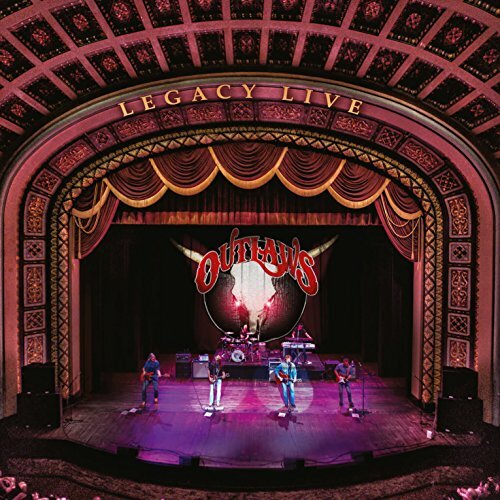 Legacy Live is classic Southern Rock and classic Outlaws. If you have any questions about this product by SPV, contact us by completing and submitting the form below. If you are looking for a specif part number, please include it with your message.